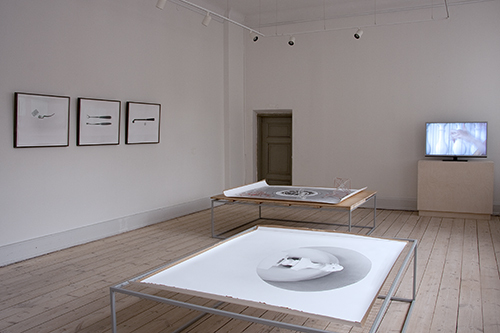 The exhibition Human Silver Halo was the first outcome from a period as a visiting Guest Curator at the Medical Museion. The project started with conceptual engagement with the Museion’s extensive collections of artifacts, the knowledgeable people working there and especially the auditorium dating from 1787 that is still in use today. The Medical Museion’s spectacular auditorium is explored as a beautiful architectural manifestation of western society’s value systems governing power and knowledge. Museums are great centres of shared knowledge, and are rightfully valued and celebrated by society. These same collections are also evidence of human curiosity and our quest for knowledge. Especially interesting and distinct from other similar institutions are medical museums, distinguished by the simple fact that we all have some embodied knowledge of the subject matter. During an accompanying artist residency at the Danish Art Workshops, a series of human sized analogue photographs of the Museion’s auditorium were made, along with images of medical instruments from the collections and a film of a female musician playing the harp in the empty auditorium. Analogue photography was the primary medium for this project owing to its use of silver, which since Hippocrates has been connected with healing. Though antibiotics have replaced the medical use of silver today, further research into its clinical potential is ongoing, signalling a very human reluctance to surrender the idea of its healing properties. The publication Human Silver Halo – Seats of the Muses, which explores the notion of healing, accompanied the project; an item distributed free of charge to the viewer with texts by eleven interdisciplinary contributors including academics, architects, artists, designers, and philosophers. A few of the exhibited photographs have small clusters of red circles drawn onto their surfaces, made with a technical ink pen. These nesting circles are simple handmade marks. They embrace the intricate and aesthetic, asking the viewer to contemplate both the deliberate handmade marks and the photograph that accommodates them. The photo and drawing represent different value systems that in the artwork are appreciated and questioned equally – considering approaches to flattening the hierarchy within the power of knowledge. Left an installation shoot from the exhibition Human Silver Halo where the piece was shown.